I’ve been planting my vegetable gardens intensively since stumbling upon a book called High-Yield Gardening published in 1986. 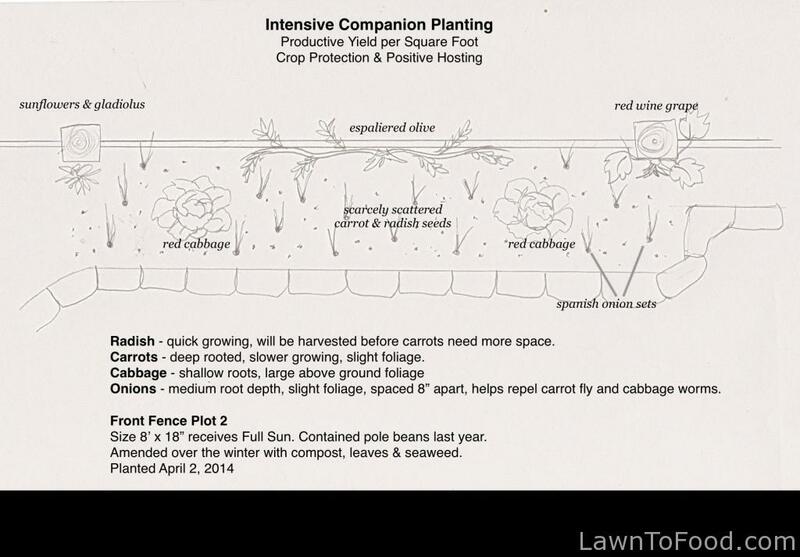 Some of the information is, of course, outdated now, but I still refer to it for companion planting selections and season extending ideas. More recently, while investigating the principles of Permaculture, I learned even more important reasons to intertwine and intensively plant my vegetable garden plots. Here are a few sensible ideas why it is beneficial to intensively companion plant rather than in rows or blocks (monoculture). Minimize Risk – when you plant several different crops in one area, if one fails due to weather, pests or disease, the whole space will not be lost to production. Crop Protection – More robust plants can offer shelter to the more delicate ones, from harsher weather like high wind and hot sun. I grew a great crop of Basil in the shadow of mature Cauliflower last season. Organic Pest Management – I think of this as hiding the “precious ones from prey”. For example, interplanting garlic, onions and marigolds around Brassicas (cabbage, broccoli, etc.) can confuse the Cabbage Worm Moth. This year I am going to try and confuse the Carrot Fly by interplanting carrots with onions. Use of Space – Not only is companion planting about combining varieties that enhance each others growth, it’s also about utilizing the space above & below ground. I try to incorporate deeply rooted vegetables along side ones that are shallow rooted, so that they don’t compete with each other for soil space. The same theory is used above ground, especially with the classic “three sisters” planting combination of corn (tall and strudy) with pole beans (use the corn to climb on, and fix nitrogen to the soil which feeds the corn) and squash (which ambles around the ground, acting as a living mulch that helps hold water in the soil). This is a diagram of my Front Fence Plot #2 that I planted yesterday. It’s done in intensive companion planting style, where (hopefully) each plant will benefit the others in some way. 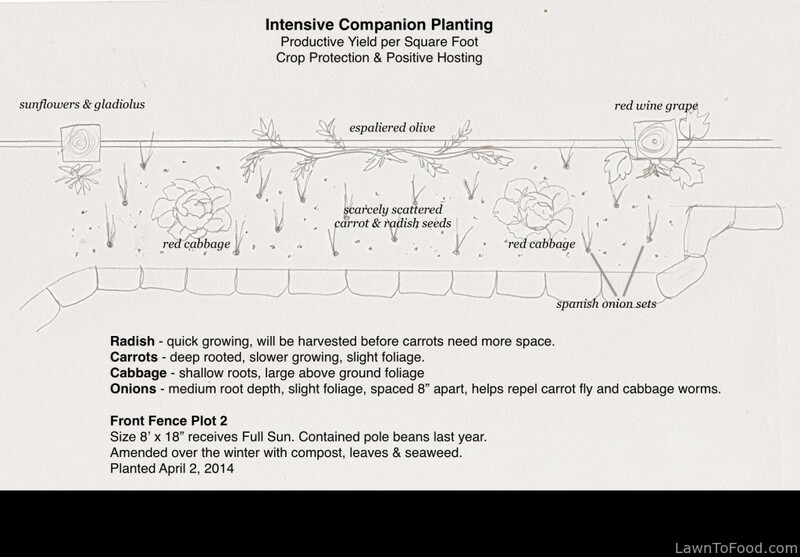 This entry was posted in Crop Planning, Growing Food and tagged companion planting by Lynda. Bookmark the permalink.